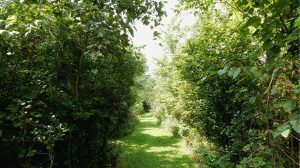 Experience peace and tranquility in walking the trails and labyrinth. Feel a connection with creation and the creator. The property is unusual as it hosts many types of ecosystems in a relatively small area. 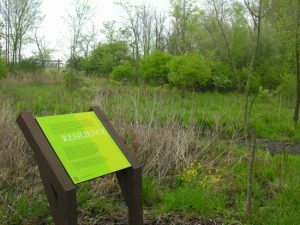 160 acres hosts different habitats: field, forest, wetland, woodlands, and a riparian corridor. We are committed to maintaining the diversity of habitats and ensuring the health of the land and its inhabitants. Peace, insight, comfort, healing, energy, connection, and letting go are words often used to describe a walk in the labyrinth. Walking this circular path provides a time of quiet and meditation and reminds us of our life journey with its twists and turns. A single half-mile path leads to the center where the same path is followed back out. Monthly public walks are scheduled year-round. Available to walk when open to the public. Groups renting the facilities walk the labyrinth. School and camp groups participate in guided walks, stopping at stations to reflect on the gifts of creation. Groups can schedule a time to walk. Walk the 13 reflective stations on the trail. Each station offers something for the mind, body, and spirit. A sign can be found at each station with theme-centered factual information, reflections, and suggested activities. We are grateful to the Capitol Square Rotary which provided funding, labor, and assistance with the stations and to students from Upper Arlington High School who helped plan each site. Trails are open to the public Wednesdays to Fridays, 10 am to 4 pm, from April through November. Check the calendar page as we are occasionally closed. Contact us to set up a date if your group is interested in walking the trails. Please check our events calendar as we are occasionally closed.